I'm so pleased to have Destiny Soria today at Sarcasm & Lemons! 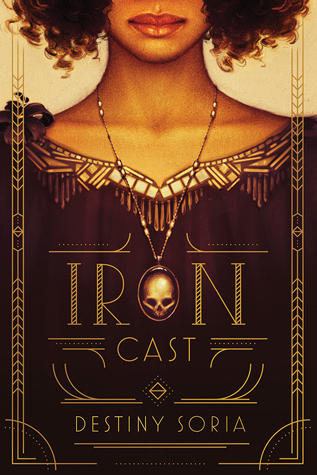 She was kind enough to answer a few questions about her debut novel, The Iron Cast. Check out my review here! The idea for the Iron Cast hemopaths to draw power from their "afflicted" blood is unique. What inspired you to create this form of magic? I loved the idea of a magic that was channeled through the creative arts, but I also wanted it to be grounded somewhat in science. (“Somewhat” being the key word here.) So that’s when I decided on the idea of an unidentified element in hemopaths’ blood that activated their special talents. What was the most difficult part of writing Iron Cast? Probably the revisions between my first draft (which I wrote during NaNoWriMo) and the draft I sent to my agent. It was such a horrible, meandering mess and trying to edit it into something readable was truly daunting. Which scene or character was the most difficult to write? Which was the most fun? I’m terrible at writing romance, even when it’s very, very light. I blush furiously the whole time and have to take frequent breaks to writhe awkwardly. There’s not a lot of romance in Iron Cast, but a lot of awkward writhing went into it. I probably had the most fun writing the banter between Corinne and Ada. My friends and I exchange more quips than a sitcom, so it was very natural for me to write. How did you go about making the 1919 Boston setting feel authentic? Research, research, research. I also watched a lot of movies and read a lot of books set in the 1920s. Race and privilege is an important theme in the book. What do you hope readers take away? What was the process like for Iron Cast from conception to publication? In order: exciting, exhausting, overwhelming, exciting again, petrifying, depressing, exciting again, overwhelming, exhausting, more exhausting, exciting, exciting, exciting, petrifying, exciting, sleep. If you can say, what's your next project like? Do you think you'll do more historical fiction or go in a different direction? I’m working on a YA fantasy right now. Can’t really give any details at the moment, but hopefully soon! What books have you enjoyed recently? I can’t stop fangirling about The Gentleman’s Guide to Vice and Virtue by Mackenzi Lee, which is out 2017. It’s a historical queer European road trip and you need it in your life. I also really enjoyed Crooked Kingdom, like basically everyone else who reads YA. Thanks so much for sharing with us! Final question: what do you hope to see more of in young adult books? Thanks for having me! And strong, complicated, healthy, uplifting, kickass female friendships ftw. Destiny Soria writes Young Adult fiction. Her debut novel, IRON CAST, will be published by Abrams/Amulet in Fall 2016. Destiny lives in Birmingham, AL, where she spends her time trying to come up with bios that make her sound kind of cool. She has yet to succeed.